Carmody Construction has been a leading Fox Valley contractor since 1948. A family owned and operated business, we have been residents of the area for generations. Also known as the Fox River Valley, the area is bisected by the Fox River, which runs through many of Chicago’s western suburbs. Covering a large area and made up of several cities, the Fox Valley is home to nearly 1 million residents. The entire area has experienced incredible growth over the years. There is a wealth of busy shopping districts and countless recreational opportunities. From bike paths to hiking trails to fishing, the area offers something for just about everyone. As the Fox Valley has developed rapidly, Carmody Construction has been at the heart of the building boom. Not only are we one of the area’s leading window, roofing and siding contractors, we’ve been building new homes in the Fox Valley since 1976. It’s that hometown knowledge that makes Carmody the Fox Valley contractor many homeowners and businesses have come to trust. We use only the highest quality products from vendors like CertainTeed, Millgard and Andersen Windows & Doors, and our professional installers and carpenters don’t leave the job site until the results meets our customers’ highest standards. Whether you’re looking to remodel your bathroom, kitchen or finish your basement, Carmody Construction is the Fox Valley construction company to call. If you’re looking to spread out the payments for your home improvement project, Carmody offers 0 percent financing for up to 21 months. We also offer free, no obligation consultations. Contact us or call (630) 355-0002 to speak a company representative today! Live in Fox Valley? 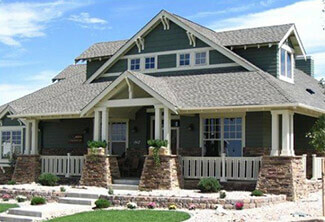 Need Windows, Siding, or Roofing Services? Schedule an appointment today! The roofer came out tore off the old shingles and replaced with the new shingles. They worked really hard all day, all the while cleaning their mess up. On the next day they finished up the little bit they had and picked up everything around the house. Eric was a very easy person to talk or get a hold of I would recommend them to my family or friends.